Two articles in the New York Times on resignations at Council on Foreign Affairs (June 5 and June 16, 2004) plus The Nation article, which was posted June 3. The chief Latin American expert at the Council on Foreign Relations, the nation's pre-eminent foreign policy club, has quit as a protest, accusing the council of stifling debate on American intervention in Chile during the 1970's as a result of pressure from former Secretary of State Henry A. Kissinger. Kenneth Maxwell, a senior fellow for inter-American affairs at the council, announced his resignation in May 13 letters to James F. Hoge Jr., the editor of Foreign Affairs magazine, where Mr. Maxwell had reviewed a book on American involvement in Chile, and to Richard Haass, president of the council's board. Mr. Kissinger is traveling, said an assistant, Jesse Incao, and could not be reached for comment. Officials at the Council on Foreign Relations strenuously denied that Mr. Kissinger, whose friends include some of the council's biggest donors, had exerted any pressure, directly or indirectly, to silence Mr. Maxwell on this issue. The roots of the current dispute date back to last winter, after Mr. Hoge invited Mr. Maxwell to write an extended review of ''The Pinochet File: A Declassified Dossier on Atrocity and Accountability'' by Peter Kornbluh (New Press), a book that re-examines the American role in helping to unseat Salvador Allende, the socialist president who died during the military coup that brought the brutal regime of Gen. Augusto Pinochet to power. The book is based on 25,000 United States government documents that were declassified in recent years. Mr. Maxwell's essay largely summarized the unresolved questions surrounding American actions in Chile, mentioning three issues in particular: the 1970 assassination of a Chilean general, Rene Schneider; the September 1973 coup against Allende; and the assassination of Orlando Letelier, Allende's former foreign minister, in September 1976. The review outraged William Rogers, the former assistant secretary of state for Latin American Affairs under Mr. Kissinger and a vice president of his consulting firm, Kissinger Associates, who wrote a lengthy response in the following issue of Foreign Affairs. After the exchange, Mr. Hoge said, Mr. Rogers approached him once again, saying that Mr. Maxwell's response to his letter had raised new charges that he felt entitled to address. Specifically, Mr. Rogers felt he and Mr. Kissinger were being accused of complicity in the Letelier assassination, Mr. Hoge recalled. Mr. Maxwell said that he was not accusing the men of complicity but rather of failing to stop the campaign to assassinate opposition figures abroad. He cited an August 1976 order from Mr. Kissinger to ambassadors in South America, to warn governments there that the United States would not countenance political assassinations on its territory. At least in Chile, that order appears not to have been delivered, nor was it insisted upon. The next month, Letelier's car was blown up by Chilean secret service agents on a Washington street. Mr. Hoge said he had told Mr. Rogers that if he stuck to the historical issue, the journal would not run any response from Mr. Maxwell this time. ''He promised me that I would have the last word and that Maxwell was shut off,'' Mr. Rogers said in an interview this week. Mr. Maxwell agreed he had said he wouldn't need to respond as long as there were no personal attacks, but he changed his mind after seeing the actual letter. Mr. Hoge still said no. Mr. Hoge said he was not reacting to any private pressure from board members or elsewhere, but felt that the time had come to put an end to a debate that was going nowhere. ''I thought both of them had had a good go at their feelings of the Pinochet book,'' Mr. Hoge said. Whether or not there were any hidden strings pulled to give Mr. Rogers the final word, as Mr. Maxwell claims, the dispute underscores an intense competition under way to shape the way that history is told, particularly regarding the United States involvement in Chile, as more and more documents touching on Mr. Kissinger's legacy are released. ''The key is the suppression of debate on foreign policy by a major figure in a major foreign policy magazine,'' said Mr. Maxwell, who is now headed for Harvard University as a senior fellow at the David Rockefeller Center for Latin American Studies. Nor was Mr. Kornbluh pleased. He, too, had tried to submit a letter, but was also turned down. ''I thought that Foreign Affairs was being grossly unfair to me as the author of the book that was the foundation for the entire debate, and to Ken Maxwell, who was obviously their own analyst and their own reviewer,'' Mr. Kornbluh said. This time, Mr. Hoge said, the dissent would appear in the letters column of Foreign Affairs' next issue. An article in Arts & Ideas on Saturday about a dispute at the Council on Foreign Relations over American actions in Chile in the 1970's omitted credit for an earlier account. The Nation magazine reported the situation on its Web site on Thursday. WASHINGTON, June 15 --A Princeton University expert on Latin America says he has abandoned plans to become Foreign Affairs magazine's book reviewer covering the Western Hemisphere, citing accusations that the journal bowed to pressure from Henry A. Kissinger and his associates. The expert, Jeremy Adelman, agreed in May to take on the reviews later this month when Kenneth Maxwell leaves his post as a senior fellow at the Council on Foreign Relations, which publishes Foreign Affairs. But Mr. Adelman said that he had second thoughts after reading accounts of a dispute between Mr. Maxwell and his editors and senior officials of the council. Mr. Maxwell resigned in protest on May 13 after reviewing ''The Pinochet File: A Declassified Dossier on Atrocity and Accountability,'' by Peter Kornbluh. 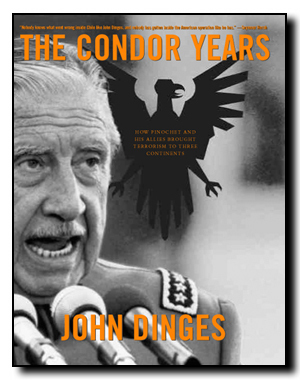 His review angered Mr. Kissinger, the secretary of state when Gen. Augusto Pinochet seized power in Chile in 1973, and William Rogers, the former assistant secretary of state for Latin American Affairs under Mr. Kissinger. (Mr. Rogers is now a vice president of the consulting firm Kissinger Associates.) Mr. Rogers contended that the review exaggerated United States responsibility for the downfall of the Chilean president Salvador Allende. Foreign Affairs then published an exchange between Mr. Rogers and Mr. Maxwell, and gave Mr. Rogers the last word in a subsequent letter. Though the journal customarily lets authors reply to criticism, it has refused to publish Mr. Maxwell's rebuttal, in what he charges is a bid to silence debate over United States policy on Mr. Kissinger's watch. Mr. Adelman said that soon after accounts of the dispute appeared in The Nation, The New York Times and the Folha de Sao Paulo, a Brazilian daily, he received numerous e-mail messages , some attacking him as ''a scab.'' His resignation was reported on Sunday in the Folha and in another Brazilian daily, O Globo. ''While I still think this is an important position and the magazine is important, the amount of time it would take for me to explain the situation to the world of Latin America experts, the world that I inhabit, was too great,'' he said. He added that the editor of Foreign Affairs, James F. Hoge Jr., was quoted in the Folha as saying that Peter G. Peterson, the council's chairman, had called to advise him that the review had upset Mr. Kissinger and others. Mr. Hoge acknowledged the call yesterday, but denied that Mr. Kissinger had pressured him. He demanded that Mr. Maxwell produce proof of his accusation. He said that he did not print Mr. Maxwell's final rebuttal because both sides had had their say. Mr. Maxwell said that he had learned of the pressure in discussions with Mr. Hoge and had kept records of those conversations. Theresa Cimino, an assistant to Mr. Kissinger, said he was traveling and could not be reached for comment. Mr. Hoge said that he was surprised at Professor Adelman's resignation, and that the professor -- not Foreign Affairs -- had bowed to pressure. nation's pre-eminent foreign policy think tank. tragic martyr to a lost cause." Pinochet File and Kenneth Maxwell's review of that book." extracted painfully, like rotten teeth." Council on Foreign Relations, where he is a senior fellow." provide a shield for his boss to hide behind"--but it never appeared. matters, and they bring heavy guns to bear." of the historical record. The Council's current relationship with Mr.
actions as a public figure. This I want no part of." Rockefeller Center for Latin American Studies at Harvard. details in the pages of Foreign Affairs.